Hello forum! I am not new to the RC world but I am new to the HPI Baja. After doing some research I ended up here. I want to be sure this car is not a clone. He tells me it has a new CY motor and some after market parts. The rims & front A arms are orange. Is that the sign of a clone? The seller swears it is all HPI or quality after market. What do you guys think? Real or clone? The arms are made by RPM, and he changed out the beadlock rings to orange ones. It looks like a HPI Baja. Yes, unfortunately it is the only pic I have. I am going tomorrow to look at it. Thing is I am selling a scooter on CL for $400 or trades (I mentioned RC stuff in the ad) and he offered his 5B. The guy seems legit I just want to be sure it's not a pile of crap. He says it has RPM A arms (explains the orange? ), Hostile carriers, HD dog bones, aftermarket fuel cap, DDM side mount pipe, stock CY engine, rear shock towers, etc. Anything specific I should check out other than the normal stuff. Serial numbers? And whats with the raised part on the roof? Roll over skid pan? And whats with the raised part on the roof? Roll over skid pan? That is a plug protector from a 5T/SC. They are a good add on to protect the spark plug from breaking. Just get the ss kit I bought a baja 5b last year on cl guy swore it was a real HPI,it was not,diff blew out about a half a tank later,and I ended up spending more then I payed just fixing it. 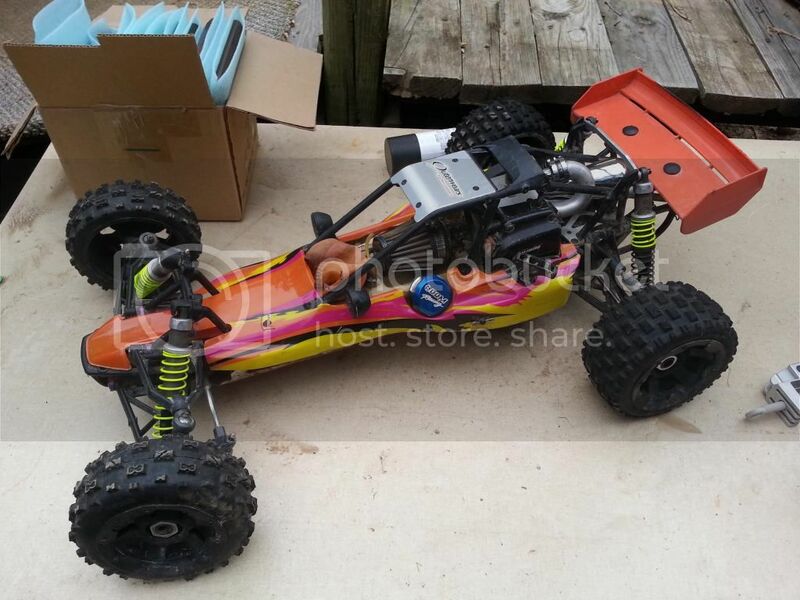 Got a chance to pick up a 5B, can I get some opinions on whether or not this is a legit HPI or not. I have not seen this in the real, just this picture but I'm being told that it is an HPI. What do you guys think? Considering what is in the pic, if I would look at this in person, what would be the single thing that would confirm it was a true HPI that I can look for? just a quick thing is to look at the screws in the front loop, bumper brace. look at the screws in the side of the center top, sides of the cage where it screws together. most people that try to pawn a knock off as an HPI forget to replace those screws. IMO If its not made by hpi, its a clone... partial or fully modified hpi bajas are "clones/custom". By new, keep it stock and now you have a genuine hpi baja. To keep it simple, dont discard any original parts during modification. Especially parts with sereal numbers... if you want to sell a genuine hpi, reassemble your baja back to stock. remove the spur gear and look for a purple spacer if it is behind the spur gear than it most likely is a HPI Baja.